The term Supported Employment describes a set of values and processes which form a personalised model for supporting people with significant disabilities to secure and retain paid employment. The model uses a partnership strategy to enable people with disabilities to achieve sustainable long-term employment and businesses to employ valuable workers. Supported Employment is an evidence-based and personalised approach to support people with significant disabilities into real jobs, where they can fulfil their employment aspirations and achieve social and economic inclusion. The overarching guiding principle of Supported Employment is that it is designed to support individuals who do not necessarily meet traditional criteria for 'job readiness' or 'employability'. Fundamental to Supported Employment is the principle that everyone can work, with the right job and the right support. Supported Employment agencies should be able to offer a nil rejection policy, as everyone should have the opportunity to work and contribute to society. Supported Employment has, at its heart the notion that anyone can be employed, if they want paid employment and sufficient support is provided. It has a number of defined steps. Customer engagement: Many potential jobseekers are using traditional day services or receiving support from health and social care agencies. Others may be isolated at home or in danger of exploitation. People leave education every year with the hope of finding employment. In the past, professionals and families have had low expectations of people with disabilities finding sustainable work. It is important that expectations of employment are raised across health and social care services. The co-location of staff is particularly useful to achieve this. Vocational Profiling: This is a "getting to know you" process where we identify the aspirations, learning needs, individual skills, former experiences and job preferences of the participant. Carers and support workers should be involved so that we get a holistic picture of the jobseeker. The profile informs the practical job finding and makes it more likely that we find a high quality job match. We look to identify the type of occupation that best suits a person's skills and preferences. Many people have never worked or not worked for many years and will need support to make informed choices about career opportunities. Employer engagement: The third crucial element is the job marketing process. This close engagement with employers helps them to overcome traditional recruitment and selection barriers. We know that traditional recruitment techniques can be overly rigid and formal interviews seldom result in offers of employment. Employers are increasingly recognising the value of "working interviews" which allow individuals to demonstrate their skills in the workplace and allow the employer to gather the sort of evidence that a formal interview seeks to capture. Job Matching: Once we secure employer commitment, a job analysis is usually undertaken. This checks out any assumptions made in the job description and thoroughly investigates the job on offer so that we can describe all its aspects and those of the work place, including health and safety. Although it is common practice for employers to set out the basics of a job for new recruits, it is not common for a detailed analysis of the job and environment to be available. The job analysis might point towards ways of carving together parts of job descriptions that suit the workers' talents, or creating new job descriptions that suit the worker and are cost effective for the employer. In-work Support: The job analysis and profile ensure that support is properly considered and appropriate. Support is individually tailored and targeted where it is needed most ensuring a cost effective use of resources. It is important to offer appropriate levels of support and encourage the involvement of the employer and co-workers. BASE members ensure that induction and ongoing training takes place and may offer out of work support if needed. Individual goals are agreed and recorded on a development plan. 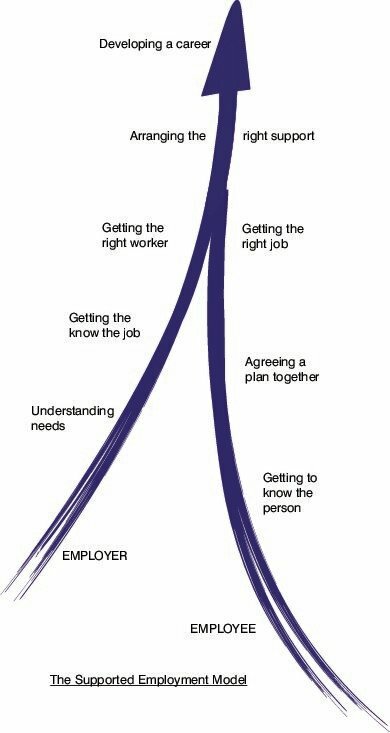 Career development: Not many people stay in the same job for the whole of their working lives and people with disabilities are no different in having to adapt to changing labour markets and wanting to improve their working lives. Supported Employment should encourage the career development of individuals by promoting training opportunities and seeking options for increased responsibility. Model and words (summarised) supplied courtesy of the British Association for Supported Employment (BASE). Visit the BASE website for full details.